General Motors, for one, will be making Apple CarPlay available on nearly its entire 2016 model lineup, according to Consumer Reports. Android Auto will come later. 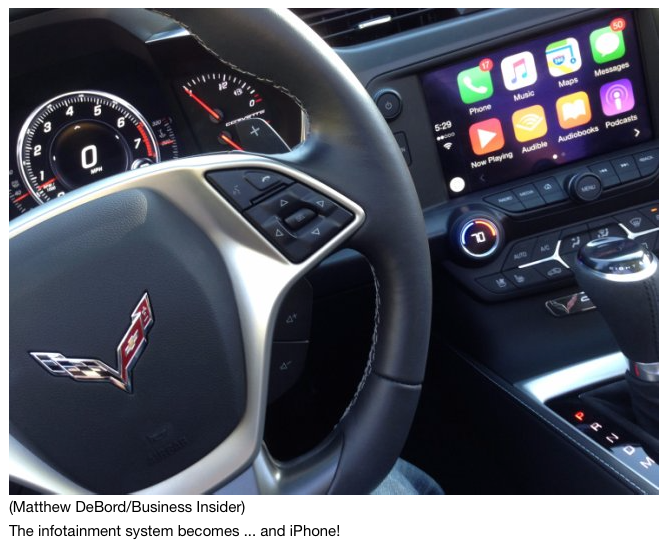 We recently spent a few days with CarPlay in a 2016 GM vehicle, and the experience was a mixed bag. But that might have had more to do with the car than with CarPlay. 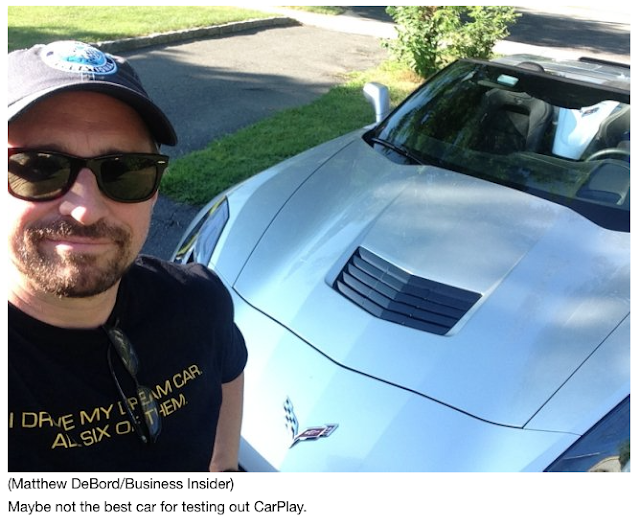 GM lent us a Corvette Stingray that was CarPlay-equipped. The Stingray was Business Insider's 2015 Car of the Year, and, for our money, it's just about the best high-performance bargain in the market. So you're really supposed to be thinking about how much giddy fun you're having while driving this sleek beast, not whether you're disconnected from your iExistence while behind the wheel. My CarPlay test might have been a bit easier had GM lent me an SUV. And one other thing — the Vette was a convertible. And it's summer. You get the idea. Still, CarPlay is astoundingly impressive in on critical respect: Siri. Siri, the iPhone's virtual assistant, hasn't exactly been a ravishing success. But that's because no one really wants to talk to their phone, at least not often. Talking to Siri in a car, on the other hand, is much more natural. Plenty of new cars and trucks have some kind of voice interface, but in my experience, they're all pretty bad. But Siri on CarPlay is brilliant. It's like having K.I.T.T. or J.A.R.V.I.S. or the computer from "Star Trek: The Next Generation" installed in your dashboard. You speak simple voice commands, like "Send a text" or "Find me a Starbucks" and Siri responds. It reads your texts and reads them mellifluously. Its machine brain understands your human diction — better, it seems, in a car. 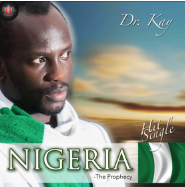 It's a revelation. And it really should make for safer driving in the long run, because a sophisticated voice system like this really does cut back on distracted driving, without the voice system being a distraction. Getting CarPlay to work is straightforward. You plug your iPhone (which has to be running iOS 7.1) into the car's USB port and presto! 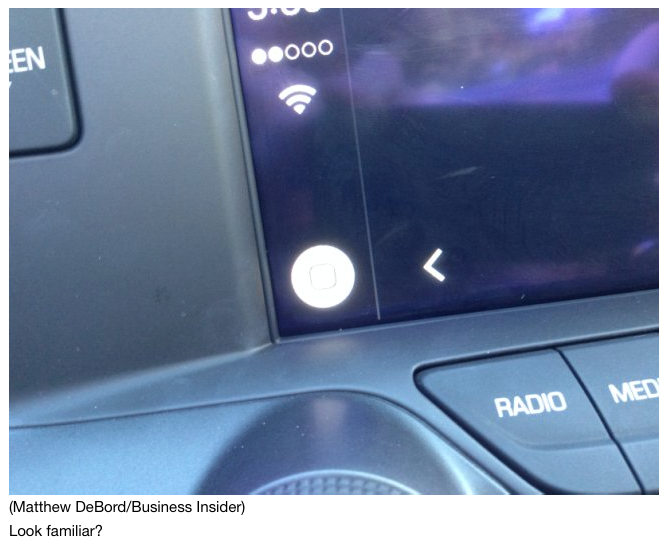 CarPlay appears as an option on the central infotainment touchscreen. 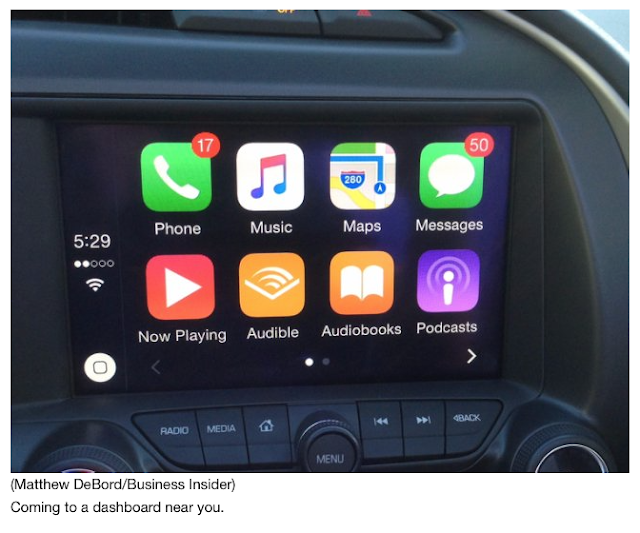 Tap it and a suite of CarPlay-ified Apple icons takes over. The navigation is then very iPhone-like, managed through a round, white home button that picks up the iPhone's critical interface feature. CarPlay is effectively a way for drivers to have access to the iPhone without have to interact with it. CarPlay doesn't fully mirror your smartphone or its collection of apps but reduces your selections to apps that deal with messaging, music, and other types of audio, such as podcasts and audiobooks. CarPlay also provides mapping and directions, and because of the Siri voice interface, it's a bit easier to use than the navigation systems that most new cars are outfitted with. It's not necessarily any more accurate, however. Bear in mind that because CarPlay relies on your iPhone, it's piping data through the phone. It's the phone doing the work, not the car. But in GM vehicles, you can connect your iPhone to a 4G LTE Wi-Fi hotspot through OnStar and avoid having to deal with steep wireless-data charges. Really, though, the Siri thing is incredibly cool. There's nothing quite like hearing that familiar voice emanating from premium Bose speakers. Siri has never sounded this good. If you're looking forward to the "Her" future of falling in love with operating systems, CarPlay Siri is a clear step in that direction. And CarPlay Siri comes across as useful, pleasant, and benign. There are no HAL 9000 overtones. Siri enjoys being your copilot. It wasn't all great. I couldn't really get CarPlay to slip up, but I did find that playing music off my iPhone was a little iffy at times. Spotify was better. But I wasn't tempted to use CarPlay for entertainment when I had SiriusXM satellite radio in the Vette. And once I was tooling along, listening to "Deep Tracks" or "Classic Vinyl," I wasn't all that motivated to jump back over to CarPlay. Also, GM's own infotainment setup is quite good. In the cars I've tested over the past year, GM's system has been neck and neck with Audi's for speed and ease of use. And GM has OnStar, which enables you to push a button and talk to an operator, asking for directions to be sent to your car. I've long been a fan, preferring OnStar to in-vehicle nav systems. There could be some behavioral or generational stuff going on here. I overwhelmingly use headphones or earbuds with my iPhone, and I'm accustomed to that setup. When I'm in a car, I want the old-school radio experience. 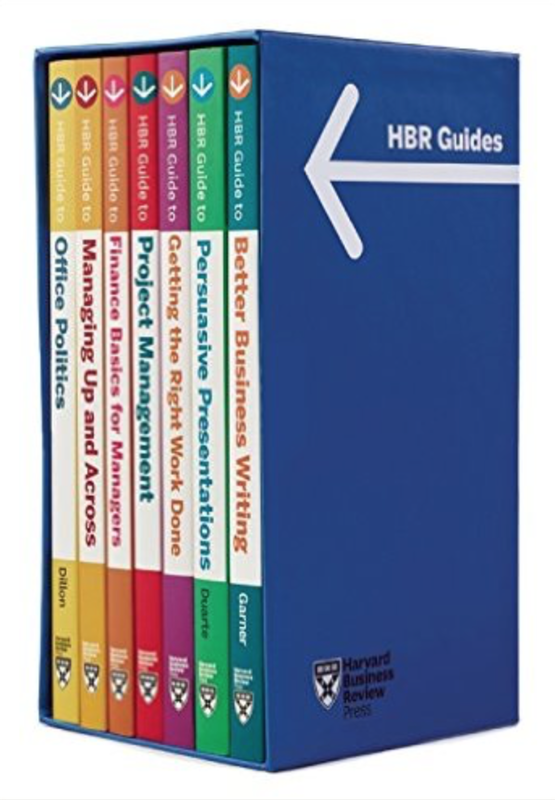 But over time, and especially if I had a commute and wanted to take in audiobooks or podcasts, I could change my ways. Additionally, while CarPlay greatly reduces distractions while driving, it doesn't eliminate them. I'm old enough to know that even fiddling with an ancient push-button car radio from the 1980s could lead to death. Infotainment systems, pre-smartphones, brought numerous new reasons to take your hands off the wheel and your eyes off the road. The advent of the smartphone sent us over the top. I now routinely ask auto executives when they — the experts on what causes people to die behind the wheel — are going to push back against the tech industry and its obvious agenda to keep us ceaselessly glued to our phones (defensive driving is no match for push notifications). I usually get a very ambivalent answer to that one. But CarPlay is the best solution I've yet seen to getting the phone out of the driver's hands. There's been some chatter in the auto industry about how continuing to invest in the development of new infotainment systems doesn't make much sense if Apple and Google can do it better. "Let's just give Apple the dashboard" is the verdict. It isn't difficult to then make the leap to the infotainment system morphing into the interface that controls the entire car. Siri plus maps plus autonomous driving add up to a car that would be radically different from what we've had for a century: steering wheels and pedals and the need for he driver to be more or less constantly engaged with the driving experience. If Apple's "Project Titan" is an actual car, then CarPlay can be seen as the first stage in the development of a user interface that at first assists and then replaces the driver. And even if Project Titan isn't a car, CarPlay is going to get better and be a cornerstone of Cupertino's efforts to keep the iPhone truly mobile, in every sense of that word. At the moment, the bottom line is that CarPlay is generally not that great, although it's absolutely fantastic in that it unleashes Siri's true potential. For me, this could be the beginning of a vast disruption. If a car can be voice-controlled, science fiction will become reality. Traditional automakers have been trying and pretty much failing for a decade to make in-vehicle voice commands work well.